The wardens and the vestry are thrilled to announce that the Reverend John Taliaferro Thomas has accepted our call to become the next rector of Emmanuel Greenwood. John is currently serving as Interim Rector at Grace Church, Kilmarnock. He has a proven reputation for servant leadership, excellent preaching, loving pastoral care, kindness and humor. John also brings extensive experience working with young people and young families, having served as a school chaplain (St. Andrews School, Potomac, MD) and Head of School (St. Andrew's Sewanee). He and his wife Janice, a registered nurse, have two children, Emily and Sam. Emily works for a non-profit in Hendersonville, NC and Sam attends Elon College in Burlington, NC. John's start date with us will be August 1st. We look forward with joy to welcoming John and Janice into our parish and our lives! Click here read the full announcement and see more pictures. Look graciously on our church as we seek a new rector. Let the Holy Spirit guide us as we work to discern our future. the courage to pursue it and the grace to accomplish it. and ever mindful of the needs of others. On June 17, 2018 The Rector Discernment Committee was commissioned to begin work on behalf of the people of Emmanuel Church. 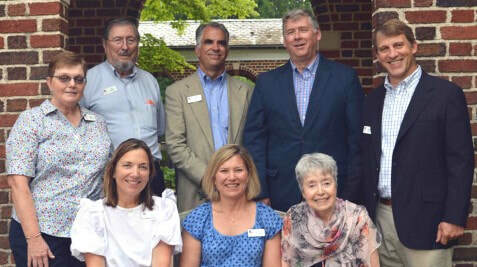 The committee is comprised of Rob Merhige, Jim Crosby, Andrew Rader, Doris Savage, Kathleen Capshaw, Steve Bragaw, Cindy Kirchner, and Pati Cunningham. Steve was born at the Chelsea Naval Hospital in Charlestown, Massachusetts, and grew up outside of Mystic, Connecticut. He was raised in the dual faiths of the Roman Catholic Church and the Boston Red Sox, with a signed, framed picture of Carl Yastrzemski holding equal pride of place on the wall with that of the Pope. As an adult, though, he chose to become first an Episcopalian and then a Nationals fan. In the eyes of his parents, Steve relates, "one of those choices made me an apostate, the other a heretic. I guess I like rooting for underdogs." Steve's family has been at home at Emmanuel since Palm Sunday 2007: he knew he had found the right church when the nice people in the box behind him waved and smiled when his youngest daughter, then four, proceeded to floss after communion. Emmanuel has been a huge part of the lives of Wendy, his wife, and his kids Elinor, John Marshall, Adelaide, and Quentin over the past dozen years. Steve's favorite Emmanuel moment though was as a Sunday School teacher, when he constructed a life size copy of the Ark of the Covenant. A graduate of Wesleyan University and the University of Virginia, Steves teaches constitutional law and American politics at Washington and Lee University in Lexington. Before moving to W&L in 2015, he was the Carter Glass Professor and chair of the Government Department at Sweet Briar College. For fun, he is a volunteer coach with the Western Albemarle High School rowing team. Kathleen and her husband Leigh live in Crozet and have been members of Emmanuel Church since 2009. They have two children, Matthew (age 19, a rising sophomore at High Point University) and Sarah (age 16, a rising junior at Western Albemarle High School). Although Leigh was an acolyte in the Episcopal church as a child, Kathleen was a member of two different Moravian churches growing up including Home Moravian Church in Old Salem (Winston-Salem, NC) where she and Leigh were married and where her father is buried. She still hangs her Moravian star each Christmas. Prior to the move to Crozet, the Capshaws attended a Methodist church in Fredericksburg. Upon arrival in Crozet, the Lehmbecks invited the Capshaw to attend worship at Emmanuel and they never visited another church. Emmanuel immediately felt like home. Kathleen has served Emmanuel in various ways including as a preschool Sunday school teacher, vacation bible school organizer and leader, lay eucharistic minister, lector and coffee hour host. Kathleen also served both on the vestry, stewardship committee and on the most recent rector “search” committee and is actively involved in supporting the website and email newsletter and other communications projects at Emmanuel, sharing her experience in graphic design and marketing. Patterson Cunningham is an Educational Consultant at Center for the Collaborative Classroom. She works with teachers, literacy coaches, and administrators across the country developing and implementing professional learning plans around literacy and social and emotional learning. Previously Pati taught at the Miller School of Albemarle and served as an Adjunct Instructor at the Curry School of Education at the University of Virginia. She is a Founder and Former Head of School of Renaissance School in downtown Charlottesville, VA.
Pati has attended Emmanuel Church for over thirty years, serving as Sunday School Teacher, Stewardship Chair, and vestry member, serving twice as Senior Warden. She and her husband Allen were married at Emmanuel in 1998. They have two children, both of whom were baptized and confirmed at Emmanuel. Haden is a rising first year student at the University of Virginia, and Thomas is a rising Senior at St. Andrew’s School in Delaware. Cindy Kirchner and her husband, John, live in Afton, Virginia near her childhood home. Cindy was confirmed at St. John’s Episcopal, Waynesboro, in 1993 and received into the Emmanuel congregation in 2002. They have three sons, now adults, who were all confirmed at Emmanuel. Their oldest son, Nick, married his high school sweetheart at Emmanuel in 2012. Cindy volunteers with the Bread Fund ministry, sings in the Emmanuel choir, and serves as a Lay Eucharist Minister. She has served on the Vestry and as Junior Warden. Cindy has taught at Rockfish River Elementary School for 19 years. She holds degrees in Music and Elementary Education and a Masters in Teaching and Administration. Rob was raised in California. He attended Orinda Intermediate School, where his greatest achievement was meeting his (future) wife Katherine during seventh grade French class. Rob and Katherine first came to Charlottesville in 1990, with Rob finishing his third year of law School at UVA and Katherine starting the MBA program at Darden. The Merhige family returned to Charlottesville full time in 2001. Rob currently works at UVA in an office that helps commercialize faculty inventions. Rob and Katherine have two children. Beau is a rising third year student at Washington and Lee. Avery is a rising ninth grader as Western Albemarle High School. Rob and Katherine started attending Emmanuel in 2004. Father Chuck served as their sponsor when they were confirmed as Episcopalians. Andrew and his wife Karyn live in Ivy and have been members of Emmanuel since they were married there in 1999. They have three boys, Simon (age 17), Harrison (age 14) and George (age 12), all of which were baptized at Emmanuel. Andrew has served two stints on the vestry of Emmanuel, first from 2002 to 2006 and most recently from 2015 to this past January. He and Karyn have served as youth group leaders, Sunday School teachers, greeters, coffee hour hosts and vacation bible school volunteers during their time at Emmanuel. Their children have attended Sunday School and currently serve as acolytes. According to Andrew, these are just some of the programs at Emmanuel that have benefited his family. However, it’s the warm smiles they receive on Sunday mornings and the love and support that encompasses that mean the most as they strengthen their faith and follow their Christian journey. Doris was born in Tennessee, and is married to John Savage, 4 children. After Union Presbyterian Seminary, Doris served the 3,000 members of St. John's Episcopal, Charlotte, as Program and Education Minister. She was a Vacancy Consultant for the Diocese of Southern Virginia and served on the Executive Board of the Diocese of Virginia. In the 70's was adjunct Professor at St. Luke's Seminary, Sewanee, Tennessee. She has been a member of Emmanuel for 18 years and is in love with the people of Emmanuel.